Roy is a professor in Color Science (http://www.rit.edu/cos/colorscience/) and guitar teacher in Rochester, NY. 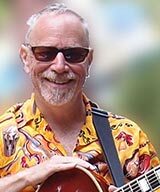 He has taught guitar at the University of California at Davis, Ashokan Fiddle & Dance Camp, and since 2005, at Puget Sound Guitar Workshop. His PSGW teaching has encompassed swing, western-swing, and gypsy jazz styles. Roy favors right-hand technique over left-hand virtuosity. He was founder and leader of LumiÃ¨re, a trio of guitar, accordion, and upright bass, and a member of the Steve Greene Trio. As a color scientist, Roy was one of the experts exposing Dressgate (http://live.huffingtonpost.com/r/segment/tell-me-why/54d54a0278c90a481e0004ba). Most recently, Roy was part of the team that created a visualization of Vincent van Gogh's Bedroom before unfortunate fading turning violet walls and doors to blue (https://www.youtube.com/watch?v=9SsUzaIDsHo).